Happy God | The Bible calls God happy. I wonder why? When friends die it always comes too soon. At least, that’s been my observation. There was a next conversation that didn’t happen. A hoped-for connection that was short-circuited by the insistence of a selfish, demanding Enemy. This week, one of my friends died. Ryan came into my life through his friendship with my kids. His picture was on their refrigerator. I met him at their house. He was engaged to Kristen, both beautiful, both outdoors people, both literate and talented and a gift to the human race. On their wedding night Ryan was struck with headaches. They spent the night in a hospital, and received a diagnosis of brain tumor, most likely terminal. For me it was hard to imagine a more diabolical life script. Yet amidst the sadness, and the lonely weeks of desperation, multiple graces emerged. True friends and sensitive strangers brought food and companionship without the intrusion of well-meaning dietary fixes or insulting pleas to bargain with God. Ryan fought hand-to-hand with his anger and regrets … until in the end he had astounded all of us with his warmth, hospitality, transparency, and gratitude for daily blessings. When a man has no discernible future, it forces him to find comforts in his past and appreciate his present. Ryan did that better than I could imagine myself doing, if our situations were exchanged. Ryan was embarrassed about what steroids did to his body. He shouldn’t have been. Ryan was self-effacing about his comments at the recent Health Summit — he shouldn’t have been. His comments were earnest, relevant and incisive. Ryan was apologetic when I asked him what he was thinking about. “I’m thinking about death. It’s very macabre.” I assured him it was not, and told him about my experience with the death of my best friend David in 10th grade, after a 4-year battle with lymphoma. I shared with him how angry I had been at God — angry that such a bright soul was lost. Angry that David had died and not me. And transformed by the experience … I told Ryan how radically it shaped my life. He seemed grateful that we could actually talk about those emotions. I wanted to continue the conversation but other friends arrived and it was time to move on. I asked if I could return in a few days to read him some poetry. He said that would be lovely. I kissed him on the forehead and told him that I loved him. He told me he loved me. But I didn’t love him all that much… my work week fell apart and the time I thought I would have off disappeared… and with it our next conversation. Here is one of the poems I wanted to read to Ryan last Thursday or Friday. Flew off on bright wings. –Rebecca Elson — a promising young astronomer whose life was cut short by cancer while in her 30s. Ryan died Sunday morning. I missed our next conversation… and hope for another one, sometime, someplace. My quora answers sometimes seem like they may have value on their own. If you begin to love yourself, which the Bible encourages, you will at least recognize that you have an important role to play as a member of the human race and, one day, a joint participant in the noble obligation of protecting a world and contributing to a community. Your unique perspective, including the sense of failure you are feeling now, is valuable and necessary to the balance that will one day characterize the human race. And if you begin to love your neighbors as much as yourself, as the Bible also encourages, you will find that many, many of your neighbors near and far desperately need significant contributions that you can make… And that would be lost without your help. Read psalm 139. There it talks about each human being in the womb. How each of us is made in secret so to speak. The truth is that you are a miracle. If your creator loves you, why shouldn’t you love yourself? You should love yourself for what you mean to your family. Most likely, there are family members who dearly love you. You should love yourself for who and what you are. The way you contribute to your world. You make more contributions than you are aware of. Allow others to tell you what these contributions are… and don’t dismiss them. You should love yourself for what you can do or become — your talent, nascent character, aspirations. If you begin to do one thing, every day, for 15 minutes… to help another, or to make the world better … such as learn to whistle or play a song, become well-informed on a topic and teach it to others, work an extra hour and give it to someone who needs it, read to a child, paint an abandoned fence or clean up a dirty section of the roadside. Write a story or a movie; join Big Brothers/Big Sisters and mentor a kid. There is no end to the possibilities. By far the most useful investment of time, if you feel drawn to it by God, is to study the Bible, obey the correction it gives to your heart, and share what it teaches you … in a way that does not condemn people, but builds their hope and goodness. And you should, even on your worst days, love yourself for what God, your creator has invested in you. As Martin Luther put it, if you want to know how big your sins are, look at the price God used to atone for them. He applied the most precious substance in the world — the blood of Christ. That makes you incredibly valuable. And God will get his investment in you. God is a patient investor in the human race and planet earth. He’s been working toward his goals for almost 14 billion years, and a little human depression is not a roadblock to him. Your current ambivalence will not be used against you. God — who holds and protects your destiny — is smiling and happy, knowing that in the fulness of time your sins will be blotted out, and your value will grow like the lily, the cedar, or the pearl. Last Christmas I snapped these photos of a nativity scene in the town where I live. It struck me as odd, and I wanted to write a blog post about it… but I wasn’t ready. My first question was intent. Why would a nativity scene — something that calls to mind “good tidings of great joy to all people” — carry an admonition with it? My instinctual response may not be yours. I grew up, steeped in a tradition of conflict with mainstream Christianity. I grew up using the phrases “nominal Church” or “Churchianity” to describe all the other guys. I remember having a conversation about religion with one of the older girls in the neighborhood (I was in 2nd grade, she was an “older girl” in 3rd or 4th grade) on our street. She said, “I’m a Christian. What are you? I think I said, “I’m not a Christian, I’m a Bible Student”. She was concerned. It was obviously a bad thing not to be a Christian. I went home and asked my mom: “Am I a Christian?” Mom’s answer was too complicated for me to remember but my takeaway was that yes, in some way I was a Christian, but different. And in some way she thought we were better. I remember a conversation with my sister, maybe a year later. By then my best friends on the block were two boys, Mike and Mark, who lived about 6 houses away. They were Catholic, whatever that was, and went to a different elementary school — St. James the Less. I was curious why a saint would be called The Less, and I wondered what it was like to have nuns as teachers. In those days I saw them at the store. They wore black and white robes and were known for being very strict. Mike and Mark were scared to death of them… and seemed to get in trouble a lot. 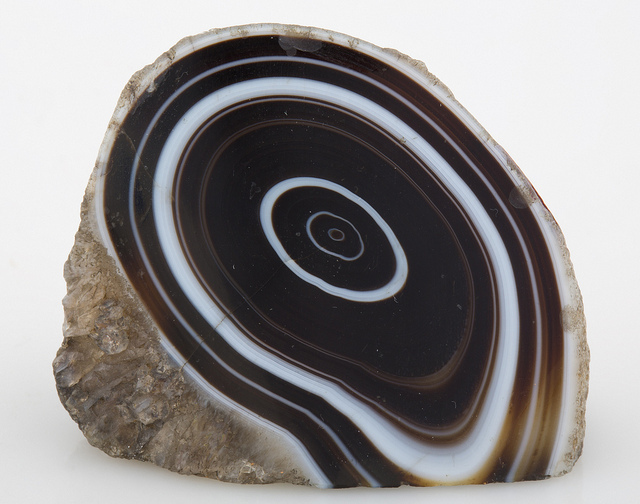 I found an agate the size of a football that looked a lot like this when I broke it open. I suspected a “bad Catholic” of stealing it. Time painted over the grief, but not the soul-wound that remained. Mark and Mike moved away, a year or two after Tommy’s dad (another bad Catholic who we rarely played with) had a fistfight with Ricky’s dad in the middle of the street on a Saturday morning. Something about whose kid was the bully. I think Ricky’s dad was Methodist. Mark, Mike and I watched this surreal altercation with half a dozen other kids (and a few parents). No one called the police. Kennedy hadn’t died yet. It was a Free Country. Fools could fight… and it was mildly entertaining. But we stopped playing at Ricky’s. And I now had a new category of bad Christians at the tender age of 9. When I was 16 my best friend David died. I’ll tell you that story someday. But the result for me was that, surprisingly, I got interested in religion. It could have gone the other way, but it didn’t. As David was struggling with his lymphoma, I was reading a ton of stuff about the Bible. And I even read the Bible, too! I was interested in religion but I never went to “church”. I went to “class”. We sat around and took turns trying to be polite while saying what the Bible really meant. On New Years’ eve we had “watch night” where everyone shared their testimony of God’s Love in Our Lives while the kids played games in the basement. Then David died, and I was angry at God that it was him and not me. One day, a few months later, I was home on a Wednesday evening while my parents were at “class”. The doorbell rang. Our best friends — I’ll call them Jim and Don — stood at the door. They said “We want to give you this.” They gave me the box of hymnals that for years I had helped to pass out at the Sunday meeting. The handmade wooden box with the brown alligator vinyl covering and the round metal corners. And they gave me the money box, and an envelope with the donations that had been in it neatly accounted for in pencil. That’s all that happened. It felt odd, because they normally went to Wednesday class and could have given the stuff to my parents there. It was also weird that they didn’t come into the house when I invited them. No pleasantries… they just gave me the stuff politely and left. I was barely conscious that the Sunday before, one of the two elders in the class had not been elected in the annual vote for leaders. They and almost half of the class simply stopped coming. No more monthly get-togethers. No more home-made noodles that Jim’s wife used to make. My parents never explained it to me, and barely mentioned Jim, Don, the other elder and his wife, for years. Sometimes I heard crying, behind my parents’ bedroom door. But stoicism was my main observation. Our best family friends, who had a boy my age, also stopped coming. And at our monthly conventions around Ohio, I lost my friends Donny Lee, Cherry Sue, John, Susie, and a bunch of others … because the split didn’t just happen in my class. It happened in almost every class across the country. As with the Saturday morning fisticuffs, I was old enough to form immature opinions about why this surreal altercation happened. I was convinced one side, and only one side, didn’t love The Truth. Of course my parents, a few friends, and me were Faithful. We didn’t want the division, but The Truth was more important than friendships. Suddenly the issue of “Who are the Christians?” had a new meaning for me. But I still wasn’t ready to get what “get ready” means.